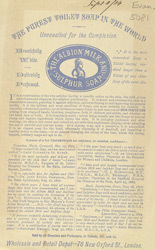 This is an advertisement for Albion milk and sulphur soap. For those living in the later years of the 19th century cleanliness was adjudged next to godliness. Soap was mass produced and was available all across the country. Acts like the Public Health Bill helped to improve the cleanliness of water supplies and for the first time water was available inside the home meaning that it was far easier to bath as well as to keep houses clean.